Have you ever watched synchronized swimming in the summer olympics? 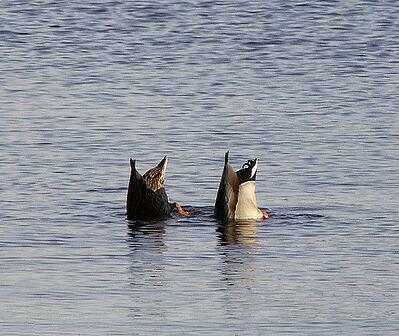 It's a thing of beauty: Two individuals gracefully mirroring the moves of each other with precision. Something similar happens in our industry, though much less graceful, and with no gold medals as reward. I'm referring to companies like Eddy and Super Custom Landscaping who take their queues from the mediocre majority of the lawn and landscape industry. Instead of perceived as progressive, this copycat culture reinforces the perception of commoditization and leads to an industry filled with undifferentiated companies. I'll admit, I like to talk to myself. 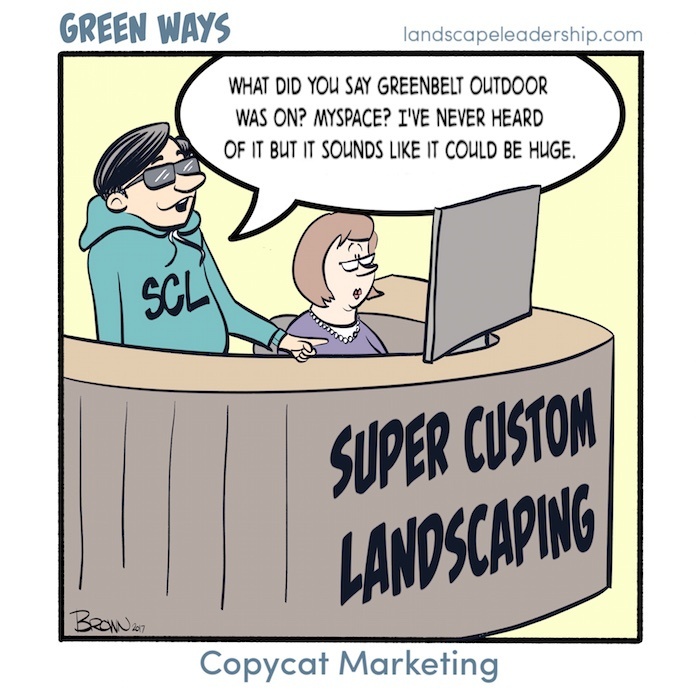 So, with that in mind, it's not much of a stretch to have a conversation with a cartoon character in Eddy, owner of Super Custom Landscaping, and competitor of Greenbelt Outdoor Services in our Green Ways comic. Chris: "How did you decide upon Super Custom Landscaping as the name for your business?" 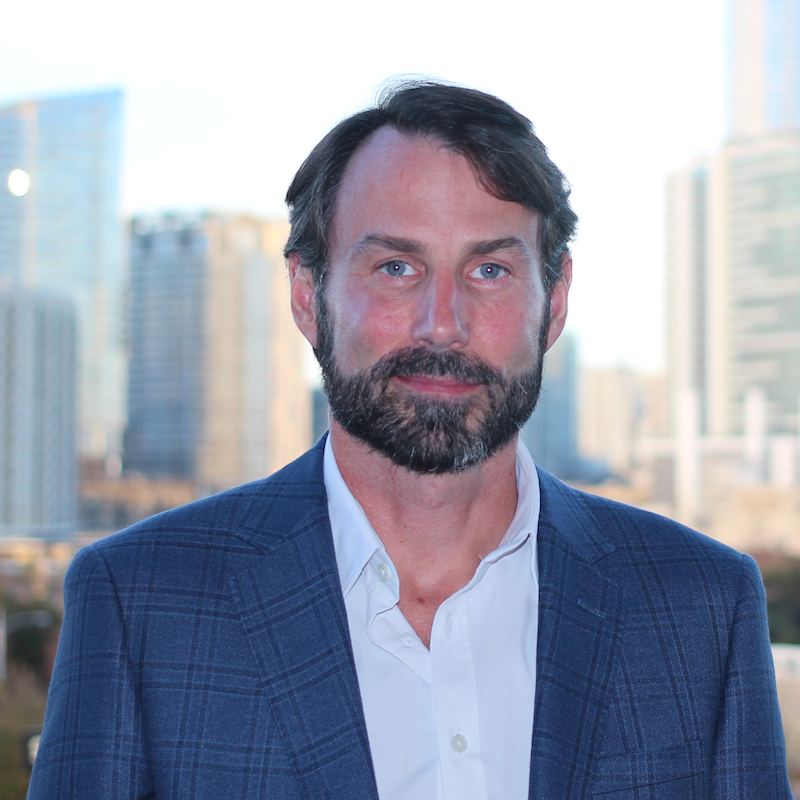 Eddy: "Another company is using 'Custom' in their name – ABC Custom Landscaping – so I thought it would be cool to have 'Super Custom' in our name. Awesome, right?" Chris: "You mentioned you added a lawn care division two years ago. Tell me about that." Eddy: "TruGreen makes a killing doing it, so I wanted to add lawn care to our services." Chris: "Right. It's TRUGREEN. They're a LAWN CARE company." Chris: "Anyway, how are you marketing your lawn care division?" Eddy: "Google Adwords mostly. And post cards. That's what I see other lawn care companies doing." Chris: "How's it working for you?" Eddy: "I have no idea." Chris: "Have you ever considered hiring someone in-house to handle your company's marketing? A marketing coordinator or marketing director?" Eddy: "Hmmm... No. Definitely not. I don't know of any other companies who have made a hire like that." Chris: "It's actually quite common in other industries." Eddy: "I just do what the guys in my peer group do." Seriously, you and I both know this is a conversation I could have with thousands of lawn and landscape companies across the country. I realize you're landscapers, not marketers. You didn't start your business because of a burning passion for promotion. But damn, ya'll! If I see another website using the same stock photography and hyperbole I might throw up on this laptop. I want you to be ten steps ahead of your competitors, not in complete synchronization and perceived as Just Another Landscaper. I've written more about this "insider group think" previously. Read the article here. Then consider the value an objective third-party can bring to your business. Getting an outsider's perspective on your marketing strategy can break you out of this copycat culture and add hundreds of thousands of dollars to your bottomline that you are currently leaving on the table. You can hire us to get this objectivity in the form of our Total Marketing Review. We'll assess everything you're doing to promote your company and services, both online and offline (sugar-coating not included). Then offer recommendations that will truly set you apart from your competitors. If you're ready for some objectivity, schedule a meeting with us. Want more insight like this? Then join over 3,000 other landscape professionals who are subscribed to our blog. You can subscribe here, or just add your email address in the form below.